In the previous post, I wondered about the differences in rower power for the different stroke profiles. Here’s a comparison between an ideal “flat” profile and the “trapezium” profile from the previous post. 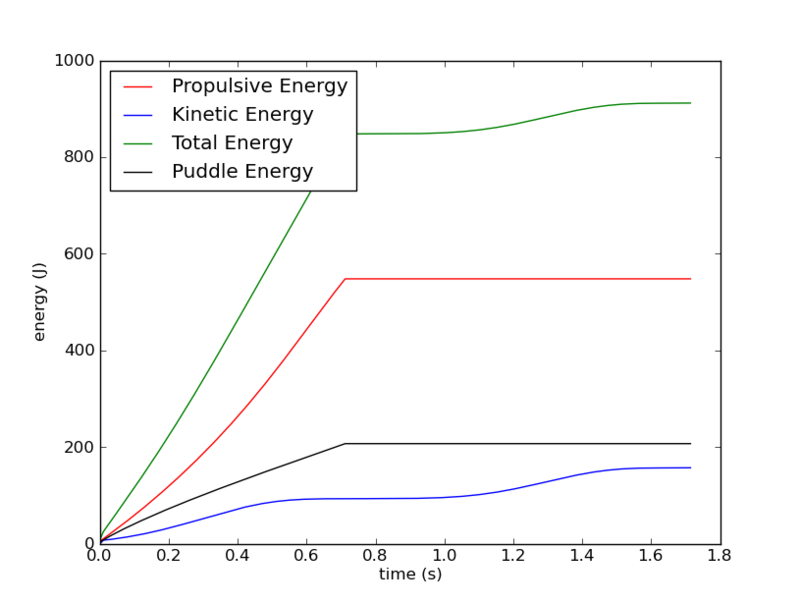 The red line in figure 1 is the energy used at the oarlock to accelerate the boat. 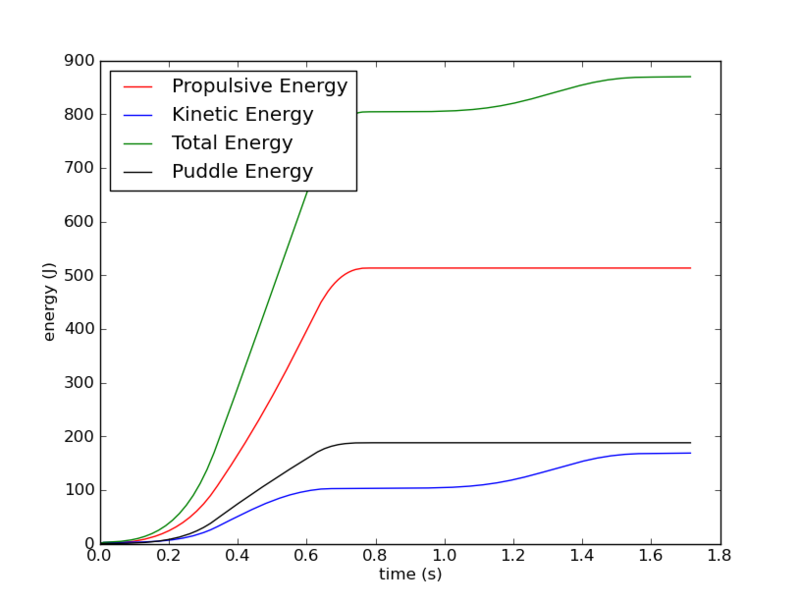 The black line is energy dissipated at the blade (creating puddles). This rower is doing 35 spm and rowing 1:57 per 500m. Figure 2 shows the same plot for the “flat” stroke profile. The mean boat speed achieved is almost the same, 1:57 per 500m at 35 spm. However, the energy consumed is higher. The “trapezium” sculler is rowing at 507W, while the “flat” sculler is rowing at 531W. So, where’s the difference? So, indeed the robot rowing a “flat” stroke force profile wastes more energy at the blade. However, he also puts more energy into the propulsion of the boat … at the same average speed. How is that possible? Is he more inefficient? 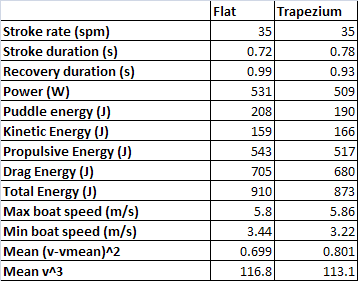 First, I looked at the maximum and minimum boat speeds, and it seemed that the “trapezium” rower had a more unbalanced stroke, with larger speed differences during the stroke. Also, the mean square deviation from the mean velocity (a very very mean paramater) is higher. However, the mean which is proportional to the energy lost in drag is higher for the “flat” rower. Especially, during the recovery, the “flat” rower dissipates more energy at the hull through drag than the “trapezium” rower. Let’s not forget that we used some extreme force profiles, which are never seen in real rowing. In reality, force profiles for different rowing styles will be closer to each other. I have a suspicion that physiology plays a larger role here than physics. It will be the movement which is most efficient and/or most powerful for the body which will make the difference. Another source of inaccuracy might be that my model does not take into account a pitching movement of the boat (around the lateral axis) which might be a source of additional energy dissipation. This entry was posted in exercise physiology, rowing physics on October 28, 2010 by sanderroosendaal.